In some instances, a baby care centre is a necessity for working parents or carers, for others, it is an opportunity for your child to be exposed to new experiences, among a range of other great benefits. At Nestle In Goonellabah our Tadpoles program offers care for children between 0-2 years of age. Providing a purpose-designed and encouraging environment that supports the individual development of each child. The Tadpoles’ area is a mix of carpeted and cushioned soft areas, as well as hard floor areas for eating and messy play. A breathable and large cot room with full viewing facility, monitors, and air conditioning ensures the comfort and safety of your sleeping child, you can read more about how Nestle In Goonellabah approaches sleep times here. Our Tadpoles’ also have a separate outdoor play area, allowing the children to feel safe and secure in their own environment. All areas at Nestle In are set up to support your child’s safety and security whilst also supplying a range of quality resources, encouraging both open-ended and structured play. Understanding the nerves that can come with your child’s first day of care, we love to welcome parents into our baby care centre Goonellabah for a “day in the life” of their child. This can be especially beneficial for first-time parents or carers who are not familiar with the day to day running’s of a child care centre. This also gives them the opportunity to acquaint themselves with the carers at the centre. During this visit parents experience the Tadpoles environment, helping them feel more secure and confident in themselves, understanding the structured daily routine of their little ones. Nestle In Goonellabah educators fully support the Tadpole’s daily routine, even the youngest child has a schedule at day care, this aids in minimising disruption and has proven to extremely beneficial. At Nestle In Goonellabah we have an open door policy where you and your family are welcome to visit our centre at any time. We encourage family participation and even encourage parents, carers and grandparents to come in for a book reading session. From newborns to toddlers, spending time with other children of a similar age in a supervised structured and safe environment promotes confidence. Our Tadpoles program also encourages children’s milestones; such as self-help skills, addressing attachment, and gross motor skills such as sitting, crawling and walking. Other cognitive boosting activities include; learning from cause and effect experiences, early literacy such as learnings from labelling items in the environment, picture books, simple songs/rhymes and finger plays. Early numeracy is also touched upon, counting, stacking blocks and cups, as the child progresses. 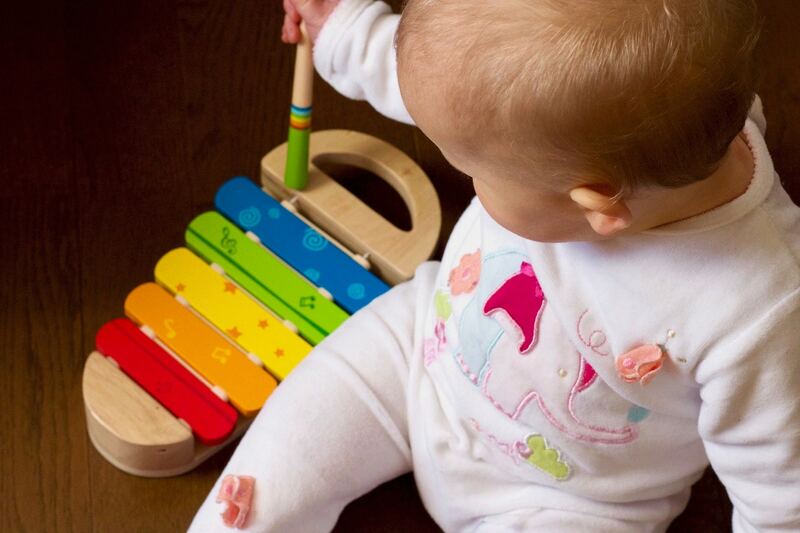 Creativity is also widely promoted at our baby care centre Goonellabah. Allowing opportunities for creativity extensively develop their young minds through finger painting, brush painting, sand and water play and dough – rolling and sensory play. Our Parent Handbook explains further essential information that you will need to be aware of whilst your child is attending care at Nestle In Goonellabah. Please contact us if you have any questions about the Tadpoles 0-2 years program at Nestle In Baby Care Centre Goonellabah facilities here, we’d love to connect with you to discuss any needs you or your child might have.